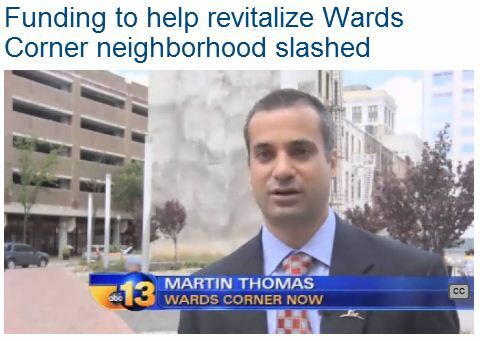 WVEC is reporting on the reduced funding planned for the Wards Corner Neighborhood plan. Their article and video can be viewed on their website. NORFOLK — For years the City of Norfolk would allocate millions of dollars to revitalizing the Wards Corner area, but this year the funds are getting slashed. City spokeswoman Lori Crouch says the City Manager was able to scrape and provide $750,000 for the proposed FY 2014 budget. “The city is fiscally stressed,” said Crouch. Less money being allocated to the neighborhood isn’t sitting well with residents, businesses owners or patrons of Wards Corner. Martin Thomas Jr. says less money coming in now could jeopardize overall progress. Previous funds were used to purchase and demolish blighted and crime-inducing properties in sections of Denby Park. The City purchased 68 units in 2011 and demolished them in 2012. In addition, 37 apartment units were bought in 2013. Once the tenants are relocated the units will be demolished. Next year, a new shopping plaza featuring Harris Teeter is scheduled to open in Wards Corner. Thomas is concerned if there is no effort in ridding blighted properties around the shopping center, it will have a negative impression on investors. “If we can show those businesses that this is a nice place to open and you are going to get a good clientele, that effect will cause more and more redevelopment in the Wards Corner area,” Thomas said. The City of Norfolk has posted its proposed 2014 fiscal year budget to the City of Norfolk website. Disappointingly the City Manager has only proposed allocating $750,000 to the Wards Corner Neighborhood Plan. That is the least amount of funding allocated to the Wards Corner Plan since 2007. Wards Corner Now, the Wards Corner Task Force, and the various civic leagues in the Wards Corner area have been resolute in their request that neighborhood plan funding be used to purchase and demolish the blighted and crime inducing properties in the Texas streets section of Denby Park. In recent years the City has been successful in purchasing 37 units in 2013 and 68 units in 2011/2012. Additionally, the proposed 2014 budget includes $500,000 to provide for the design and construction of improvements to the Granby Street and Louisiana Drive intersection. This is a part of the intersection improvements required by Harris Teeter for the new shopping center in the business district. Seven people were shot late Saturday in two separate incidents that happened about 20 minutes and 2 miles apart. None of the injuries was life-threatening, police said. The first incident occurred about 11:30 p.m., in the 7800 block of San Antonio Blvd. Five people were taken to a hospital, including two men who have been charged. The two are suspects in an attempted home robbery that apparently led to the shooting, a news release said. The three other shooting victims appear to have been the robbery’s targets. Trenton J. Ore, 25, and Joven K. Covington, 23, both of Norfolk, face charges including eight counts of use of a firearm, four counts of robbery and three counts of malicious wounding. The second shooting happened about 11:50 p.m. in the 1300 block of nearby Johns­tons Road. Detectives said two men had been in a verbal altercation with another man during a family gathering. The two men followed the third man after he left a home on Johnstons Road, but the third man later shot the other two, police said. A bullet also struck an occupied vehicle, but nobody inside was injured. Darryl Lee Speller, 22, of Norfolk faces charges including two counts each of malicious wounding, shooting into an occupied vehicle and use of a firearm. He is related to the two shooting victims, police said. You are currently browsing the Wards Corner Now - Wards Corner, Norfolk, Virginia blog archives for April, 2013.